Join Us!!! We are looking for someone to help us cover Rwandan basketball. Please send us an e-mail. Burundian Shooting guard Guibert Nijimbere (SG-95) put on an amazing game in the last round for IPRC-Kigali, receiving a Interperformances Player of the Week award for round 12. The 23-year old player had a double-double of 25 points and 14 rebounds, while his team beat Rusizi (#8, 2-8) 68-58. IPRC-Kigali maintains the 4th position in Rwandan D1. 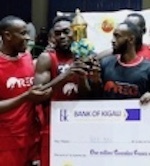 IPRC-Kigali is a typical solid league team placed somewhere in the middle or a little bit lower in the standings. They need more victories to improve their 6-5 record. In the team's last game Nijimbere had a remarkable 69.2% from 2-point range. He turned to be IPRC-Kigali's top player in his first season with the team. Guibert Nijimbere has solid league stats. He is in league's top in points (2nd best: 21.7ppg), rebounds (8th best: 8.4rpg), assists (8th best: 3.5apg) and averages impressive 3.4spg and 61.6% FGP. The second best player in last round's games was 22-year old international shooting guard Dieudonne Ndizeye (203-SG-96) of league's leader Patriots. Ndizeye had a very good evening with a double-double of 13 points and 11 rebounds. Of course he led Patriots to another comfortable win outscoring the lower-ranked Rusizi (#8, 2-8) 84-37. This victory allowed Patriots to move up to 1st position in the standings. His team lost just two games this season, while they won 11 matches. Ndizeye is a newcomer at Patriots, but is already one of team's top players. Third on the list of top players last round was another Patriots' star - center Aubi Kasongo (C-86). Kasongo scored 17 points. He was another key player of Patriots, helping his team with a 84-37 easy win against the lower-ranked Rusizi (#8, 2-8). Patriots confirms their top position in the standings. Kasongo has a very solid season. In 12 games in Rwanda he scored 9.3ppg. There will be only one (last) round of the Regular Season in D1. What a coincidence that all visitors won their games. Here is the last round review presented by ESL. The game between Top Four teams took place in . 4th ranked host IPRC-South (5-6) lost to second ranked Patriots (11-2) 71-58. They made 18-of-23 free shots (78.3 percent) during the game. Patriots forced 21 IPRC-South turnovers and outrebounded them 49-34 including a 19-8 advantage in offensive rebounds. Worth to mention a great performance of center Micheal Makiadi (-89) who helped to win the game recording a double-double by scoring 10 points and 12 rebounds and the former international point guard Aristide Mugabe (183-88) who added 14 points and 7 rebounds during the contest. Patriots' coach used a ten-player rotation which allowed the starters a little rest for the next games. The best for the losing side was point guard Medard Muberwa (-96) with a double-double by scoring 12 points, 10 rebounds, 4 assists and 4 steals. Patriots have a solid three-game winning streak. Defending champion keeps a position of league leader. IPRC-South at the other side dropped to the sixth place with six games lost. Patriots are looking forward to face UGB (#7) in the next round where they are favorite. IPRC-South will play against Espoir and is hoping to prove to their fans that the loss was just an accident. Bottom-ranked UR (0-11) is still winless. This time they could not use their home court advantage losing their 11th consecutive match to fourth ranked IPRC-Kigali (6-5) 100-79. The winners were led by Burundian Guibert Nijimbere (-95) who scored that evening 24 points and 6 rebounds and Fiston Irutingabo supported him with 14 points, 11 rebounds and 4 assists. IPRC-Kigali's coach felt very confident that he used entire bench and allowed the starting five to rest. Even 23 points by Heritier Irumva (-94) did not help to save the game for UR. IPRC-Kigali maintains fourth position with 6-5 record. Newly promoted UR still closes the standings with 11 games lost. IPRC-Kigali will play against APR (#5) in the next round. UR will play against APR (#5) and hopes to get finally their first victory. The game in supposed to be also quite interesting. Second ranked Patriots (11-2) played at the court of 8th ranked Rusizi (2-8). Patriots smashed Rusizi 84-37 on Sunday. The best player for the winners was Dieudonne Ndizeye who had a double-double by scoring 13 points and 11 rebounds. Coach 's team controlled all game and the coach could let to play 11 players saving starting five for next games. At the other side the best for losing team was Daniel Nsabimana who recorded 13 points. Patriots have a solid three-game winning streak. Defending champion keeps a position of league leader. Loser Rusizi keeps the eighth place with eight games lost. Patriots will meet UGB (#7) in the next round where they are favorite. Rusizi will play against APR and hope to secure a win. The game in was also worth to mention about. Fourth ranked IPRC-Kigali (6-5) played at the court of 8th ranked Rusizi (2-8). IPRC-Kigali defeated Rusizi 68-58. It was a good game for Guibert Nijimbere who led his team to a victory with a double-double by scoring 25 points and 14 rebounds. IPRC-Kigali's coach let to play all 12 players and allowed the starting five to get some rest. IPRC-Kigali maintains fourth position with 6-5 record. Rusizi at the other side keeps the eighth place with eight games lost. IPRC-Kigali's next round opponent will be APR (#5). Rusizi will play against APR and hope to win that game. The game in supposed to be also quite interesting. Second ranked Patriots (11-2) played at the court of 8th ranked Rusizi (2-8). Patriots smashed Rusizi 84-37 on Sunday. Patriots held Rusizi to an opponent 24.6 percent shooting from the field compared to 47.5 percent accuracy of the winners and had 22 for 30 from the free-throw line, while Rusizi only scored five points from the stripe. Patriots forced 22 Rusizi turnovers and had a 29-18 advantage in offensive rebounds. The best player for the winners was international Dieudonne Ndizeye (203-96) who had a double-double by scoring 13 points and 11 rebounds. Center Aubi Kasongo (-86) chipped in 17 points. Five Patriots players scored in double figures. Coach 's team controlled all game and the coach could let to play 11 players saving starting five for next games. At the other side the best for losing team was Daniel Nsabimana (-90) who recorded 13 points and Jules Mutangana (-96) added 4 points and 6 rebounds respectively. Patriots have a solid three-game winning streak. Defending champion keeps a position of league leader. Loser Rusizi keeps the eighth place with eight games lost. Patriots will meet UGB (#7) in the next round where they are favorite. Rusizi will play against APR and hope to secure a win. The game in was also worth to mention about. Fourth ranked IPRC-Kigali (6-5) played at the court of 8th ranked Rusizi (2-8). IPRC-Kigali defeated Rusizi 68-58. IPRC-Kigali dominated down low during the game scoring 54 of its points in the paint compared to Rusizi's 34. They outrebounded Rusizi 55-39 including 24 on the offensive glass. It was a good game for Burundian Guibert Nijimbere (-95) who led his team to a victory with a double-double by scoring 25 points and 14 rebounds. Fiston Irutingabo (-96) contributed with a double-double by scoring 13 points, 11 rebounds and 4 assists for the winners. IPRC-Kigali's coach let to play all 12 players and allowed the starting five to get some rest. Daniel Nsabimana (-90) replied with 14 points and 8 rebounds and Koffi Byiringiro (-96) added 15 points and 6 rebounds in the effort for Rusizi. IPRC-Kigali maintains fourth position with 6-5 record. Rusizi at the other side keeps the eighth place with eight games lost. IPRC-Kigali's next round opponent will be APR (#5). Rusizi will play against APR and hope to win that game. The game between Top Four teams took place in . 4th ranked host IPRC-South (5-6) lost to second ranked Patriots (11-2) 71-58. They made 18-of-23 free shots (78.3 percent) during the game. Patriots forced 21 IPRC-South turnovers and outrebounded them 49-34 including a 19-8 advantage in offensive rebounds. Worth to mention a great performance of center Micheal Makiadi (-89) who helped to win the game recording a double-double by scoring 10 points and 12 rebounds and the former international point guard Aristide Mugabe (183-88) who added 14 points and 7 rebounds during the contest. Four Patriots players scored in double figures. Patriots' coach used a ten-player rotation which allowed the starters a little rest for the next games. The best for the losing side was point guard Medard Muberwa (-96) with a double-double by scoring 12 points, 10 rebounds, 4 assists and 4 steals and Armand Cyubahiro (-97) scored 15 points. Patriots have a solid three-game winning streak. Defending champion keeps a position of league leader. IPRC-South at the other side dropped to the sixth place with six games lost. Patriots are looking forward to face UGB (#7) in the next round where they are favorite. IPRC-South will play against Espoir and is hoping to prove to their fans that the loss was just an accident. Bottom-ranked UR (0-11) is still winless. This time they could not use their home court advantage losing their 11th consecutive match to fourth ranked IPRC-Kigali (6-5) 100-79. IPRC-Kigali dominated down low during the game scoring 54 of its points in the paint compared to UR's 30 and had 34 for 49 from the free-throw line, while UR only scored eight points from the stripe. They outrebounded UR 52-15 including a 20-4 advantage in offensive rebounds. 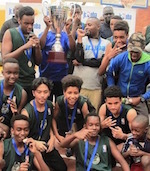 The winners were led by Burundian Guibert Nijimbere (-95) who scored that evening 24 points and 6 rebounds and Fiston Irutingabo (-96) supported him with 14 points, 11 rebounds and 4 assists. Four IPRC-Kigali players scored in double figures. IPRC-Kigali's coach felt very confident that he used entire bench and allowed the starting five to rest. Even 23 points by Heritier Irumva (-94) did not help to save the game for UR. Claude Rukundo (-95) added 12 points and 9 rebounds. IPRC-Kigali maintains fourth position with 6-5 record. Newly promoted UR still closes the standings with 11 games lost. IPRC-Kigali will play against APR (#5) in the next round. UR will play against APR (#5) and hopes to get finally their first victory. Rwanda will host the FIBA Under-16 Africa Girls Basketball Championship 2019 in August, Times Sport has learned. The local basketball body is working on determining the exact dates of the continental showpiece, that will be announced by end of this week. It is reported that the under-construction Kigali Sports Arena will host the competition, making it the first event to be held at the state-of-the-art 10,000-seat facility. Rwanda made her debut at the U16 Africa Girls' Championship 2015 in Madagascar. Head coach Charles Mushumba has named a provisional squad to start preparations for this year's regional and continental competitions, which are both to be hosted in Kigali, in June and August, respectively. Mushumba will have Claudette Mugwaneza as his assistant coach. Amelie Ella Umubyeyi, Grace Ishimwe, Christelle Gihozo, Deborah Ntawutarama, Oliviette Tumukunde, Jeanette Murungi Sugira, ketia Rusaro Munyinya, Mugeni Thalia Kayiranga, Gihana Dorcas Mwiza, Fridaus Umulisa, Hope Nyiramugisha, Allya Meghane Teta, Naomie Burasa Ishimwe, Arlette Kariza Karenzi and Stacy Charlene Usanase. Others are; Violette Uwimpuhwe, Ange Promesse Umuhamya, Stella Matutina Dusingizumuremyi, Divine Muteterabana, Lydia Uwimana Kamerewe, Raissa Hahirwa, Rolande Isimbi, Sylivie Umurungi, Azabe Atuheire Abiya Mugarura and Ramla Munezero.